After six years of packed disco dance floors at Output featuring guest artists from around the world in the Panther Room, Horse Meat Disco is transforming again. 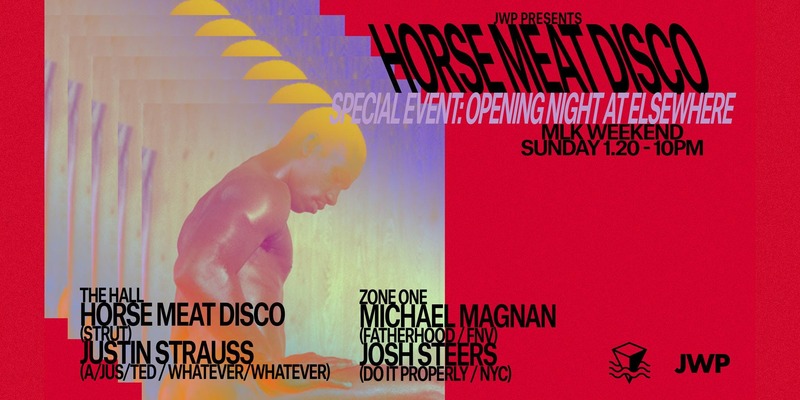 We are excited to present the special opening event of Horse Meat Disco New York 2019 at Elsewhere. Same great music, warm disco vibe, all new venue, with even more room to dance. The night will feature the DJ collective from London, Horse Meat Disco (Strut), with an opening set by NYC legend, Justin Strauss (A/JUS/TED/Whatever/Whatever) in The Hall at Elsewhere. In keeping with the spirit of our house/techno counter-programming, this MLK Weekend launch features Michael Magnan (Fatherhood/FNV) in Zone One, with an opening set by Josh Steers (Do it Properly/NYC).